NEW YORK (CNS) — As a vehicle for its star, Jennifer Lopez, “The Boy Next Door” (Universal) is basically a garbage truck. 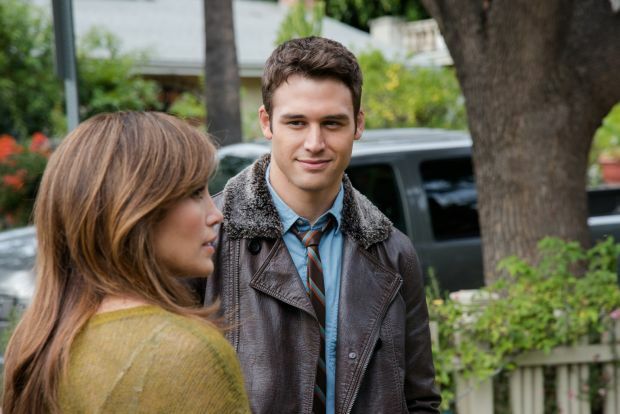 Although it succeeds in parading her flesh — and that of her male counterpart, “Step Up”-series veteran Ryan Guzman — director Rob Cohen’s trashy thriller is eye-rollingly inept on every other score. Lopez plays high school English teacher Claire Peterson. While separated from her unfaithful husband Garrett (John Corbett), Claire finds her lonely world steamed up by the arrival of a new neighbor, hunky teen Noah Sandborn (Guzman). Showing Claire no mercy from the start, Noah not only works on her car engine wearing a James Dean-style T-shirt, he also changes with the curtains open. Well, after all, just how much can a strait-laced but mildly voyeuristic gal be expected to stand? So — after a pause only long enough to allow Noah to mention the reassuring fact that he’s 19 and therefore of age — it’s off to bed with both of them. Gosh darn the luck, though, Noah turns out to be an obsessive maniac who can’t tell the difference between an middle-aged educator’s summertime indiscretion and true love. Sound like a gender-switching variation on the premise of the 1987 hit “Fatal Attraction?” It is. Unfortunately for Claire, her ill-chosen paramour has managed to befriend her bullied son, Kevin (Ian Nelson), thus putting the whole family in danger. And, to make things worse, despite being so well-stricken in years, Noah is also on track to join Claire’s class as a transfer student once school starts up again, thereby putting her career in jeopardy as well. As irresolute Claire dithers, merry prankster Noah gets right to the point, bedecking her classroom with an endless series of photos showing the two of them in flagrante. The sight of Claire’s frantic efforts to clear away this incriminating evidence while her increasingly impatient charges wait outside is as laughable as many other moments in the pulpy proceedings. The film contains some harsh violence with brief but extreme gore, strong sexual content, including graphic adultery and other immoral acts, a couple of profanities and frequent rough and crude language. The Catholic News Service classification is O — morally offensive. The Motion Picture Association of America rating is R — restricted. Under 17 requires accompanying parent or adult guardian.